Red Line Productions in association with Strange Duck Productions and Sydney Independent Theatre Company (SITCO) present, HOWIE THE ROOKIE, by Mark O'Rowe at the Old Fitzroy Theatre, Woolloomoooloo. 30 September- 25 October. Some of you may remember the tour of the Abbey Theatre at the Drama Theatre, for the Sydney Theatre Company (STC), in 2011, when they presented a play by Mark O'Rowe called, TERMINUS. It consisted of three monologues interwoven, in a performance that was mostly just a spot lit, static stand or sit. People, audiences were in a kind of rapture. HOWIE THE ROOKIE, an earlier play, by this writer, was first presented at the Bush Theatre in London, in 1999, and this production is the second at the Old Fitzroy Theatre. The first in 2003. (see comment). This play consists of two monologues from firstly, The Howie Lee (Andrew Henry), and secondly, by The Rookie Lee (Sean Hawkins). These two characters are not-blood connected, that is genetically, though are, 'bloodily' so and, certainly, situationally connected. Both men, in their abreacted monologues, cross paths with each other and meet and greet a number of common acquaintances. But, each, independently, tell their story. It is , in all, about 80 minutes long, without an interval. 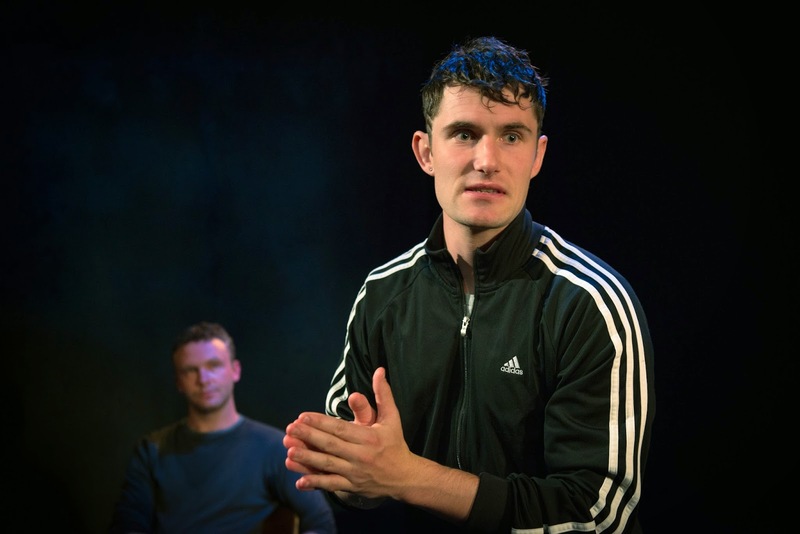 Having read the text before attending the performance of the play, my impression was of two young Dublin 'toughs', grunge, of huge natural social insufficiencies, and of low life high testosterone, of a typical Irish aggression. Alpha, sexist, cowardly males of a fairly ugly kind. Now, as well, I hate stand-alone monologues as theatre - not the first time I have said so - and, although, beautifully written, I had no inclination to want to spend time with them in a theatre. Still, I went along. Well this team of artists are of a first class kind, I estimate, and I desired to support them. Directed, by Toby Schmitz - now here is a man who is a possible Renaissance man of many theatrical talents - N.B. the word, possible. Set and Costume Design (simply and tellingly done), by Lisa Mimmocchi. Lighting Design, by Alexander Belage (a young artist I have admired in his contributions around the 'traps' in Sydney of late). Sound Design, by Jeremy Silver (his usual subtle and thoughtful contribution). And in this case a Dialogue Coach, Gabrielle Rogers, who achieves some good result with her actors with this fearful dialect. Add, Andrew Henry and Sean Hawkins, two up-and-coming theatre sparks, and something should happen. What both these two actors did, was add a humanity to the cold hard black print on the white pages of the script papers that was unexpected in my prejudiced, jaundiced, read of the play. I was more than surprised at my warming to these two men, Howie and Rookie, and dropped my judgemental condemnation of the 'types' that I had conjured as a reader. It is not that I liked them anymore than before, but I came to understand them, a little more, so that I could give a little empathy to what was happening in front of me. The power of the theatre. The persuasive gifts of the artist. First Class talents giving all they can in all areas. It is just I hate the form that the play is written in. I reckon, you could, maybe, should, get along to the Old Fitz. Everyone else really, really, loves it. Kevin - FYI - Howie the Rookie has played at the Old Fitz prior to this production. In 2003 TRS presented a production directed by Greg Carroll and played by Vincent Miller and David Whitely.